DCM Roadways provide the Construction and Engineering sectors with the finest machinery and servicing, delivered with the very best in professionalism, efficiency and customer care. DCM was founded 6 years ago, and we are based in Monmouth, Wales. Reconstruction of existing roadway to a remote cottage. Steep gradient. We are small enough to remain flexible, yet we are equipped and staffed to carry out major repairs and overhauls. 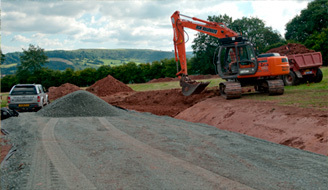 We supply a varied range of Plant & Construction Machinery. Our range of services cover almost all aspects of road construction and repair. We also deal with maintenance contracts for long term peace of mind. Our Soil Stabilisation and Road Recycling units make light work of old tracks recycling the existing stone in situ; creating a new hardwearing surface for all types of traffic.